Stay stylish in the rain by updating your regular bland umbrella into something spectacular using one of these 6 clever umbrella DIY projects. From painted stripes, stenciled fruit or dots, or applied vinyl patterns one thing is for certain your rain gear will certainly look amazing no matter which DIY umbrella idea you decide to try. Add some graphic detailing to your bland black umbrella by painting white stripes to create a posh umbrella that will help you stand out in the sea of black umbrellas when it rains. To update your existing umbrella you can use white paint or white block printing ink and a foam paintbrush to freehand paint stripes around your umbrella as done by What I Wore. This DIY umbrella is super cute, as it has a fun polka dot and heart design in the interior of the umbrella. To re-create the look you will need to cut a circle and heart out of a piece of wax paper to create a stencil that you can use to paint in the design with fabric craft paint in your favorite colors. If you are looking for an original cheerful umbrella to break out next time it rains, these DIY fruit slice umbrella with watermelon, kiwi and lemon designs should do just the trick. 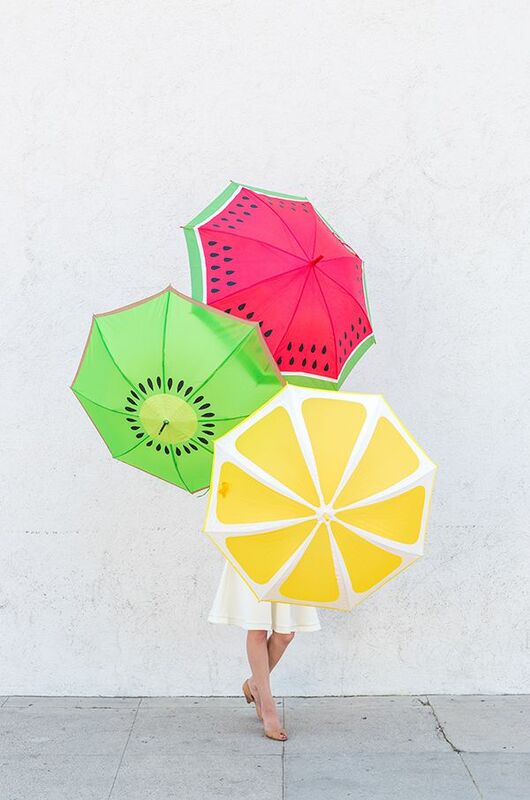 Using either a red umbrella for the watermelon, a yellow umbrella for the lemon, or a green umbrella for the kiwi design you can create your own custom fruit slice umbrella by masking off the fruit design with painters tape and painting in the design with fabric paint. Have you ever heard of the proverb ever cloud has a silver lining? Well in the case of this DIY umbrella it happens to be that every cloud has a gold lining. Using sheets of white and gold vinyl to create the fluffy gold-lined clouds you can easily decorate an umbrella using the free Cricut Explore template offered by Pars Caeli. Take an inexpensive clear dollar store umbrella and update it to have sunny gold polka dots by creating your own gold vinyl circles to stick on the umbrella. To make the circles all you need to do is use a medium-sized circle punch on sheets of gold vinyl available at craft stores. Add an elegant scalloped edge to any umbrella by using the scalloped edge template available at Sarah Hearts. Either using a Silhouette to cut gold vinyl or by cutting the vinyl by hand using the template you can easily update your umbrella to have your own custom umbrella that is a fun DIY fashion accessory.